A Republic F-105D Thunderchief in flight with a full bomb load of sixteen 750 lb (340 kg) bombs on its five hardpoints. As a follow-on to the Mach 1 capable North American F-100 Super Sabre, the F-105 was also armed with missiles and a rotary cannon; however, its design was tailored to high-speed low-altitude penetration carrying a single nuclear weapon internally. First flown in 1955, the Thunderchief entered service in 1958. The single-engine F-105 could deliver a greater bomb load than some American heavy bombers of World War II such as the Boeing B-17 Flying Fortress and Consolidated B-24 Liberator. The F-105 was one of the primary attack aircraft of the Vietnam War; over 20,000 Thunderchief sorties were flown, with 382 aircraft lost including 62 operational (non-combat) losses (out of the 833 produced). Although less agile than smaller MiG fighters, USAF F-105s were credited with 27.5 kills. During the war, the single-seat F-105D was the primary aircraft delivering the heavy bomb loads against the various military targets. Meanwhile, the two-seat F-105F and F-105G Wild Weasel variants became the first dedicated SEAD platforms, fighting against the Soviet-built S-75 Dvina (NATO reporting name: SA-2 Guideline) surface-to-air missiles. Two Wild Weasel pilots were awarded the Medal of Honor for attacking North Vietnamese surface-to-air missile sites, with one shooting down two MiG-17s the same day. The dangerous missions often required them to be the "first in, last out", suppressing enemy air defenses while strike aircraft accomplished their missions and then left the area. When the Thunderchief entered service it was the largest single-seat, single-engine combat aircraft in history, weighing approximately 50,000 pounds (23,000 kg). It could exceed the speed of sound at sea level and reach Mach 2 at high altitude. 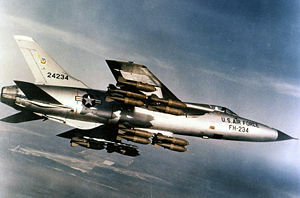 The F-105 could carry up to 14,000 lb (6,400 kg) of bombs and missiles. The Thunderchief was later replaced as a strike aircraft over North Vietnam by both the McDonnell Douglas F-4 Phantom II and the swing-wing General Dynamics F-111 Aardvark. However, the "Wild Weasel" variants of the F-105 remained in service until 1984 after being replaced by the specialized F-4G "Wild Weasel V". Republic Aviation started the Thunderchief as an internal project to replace the RF-84F Thunderflash, which first used the characteristic wing-root air intakes to make room for cameras in the nose section. The design team led by Alexander Kartveli examined some 108 configurations before settling on a large, single-engine AP-63FBX (Advanced Project 63 Fighter Bomber, Experimental), specifically AP-63-31. The new aircraft was intended primarily for supersonic, low altitude penetration to deliver a single, internally carried nuclear bomb. The emphasis was placed on low-altitude speed and flight characteristics, range, and payload. The aircraft would be fitted with a large engine, and a relatively small wing with a high wing loading for a stable ride at low altitudes, and less drag at supersonic speeds. Traditional fighter attributes such as maneuverability were a secondary consideration. Enthusiastic at first, the United States Air Force awarded Republic with a contract for 199 aircraft in September 1952. However, by March 1953, the USAF had reduced the order to 37 fighter-bombers and nine tactical reconnaissance aircraft, citing the approaching end of the Korean War. By the time the F-105 mock-up had been completed in October 1953, the aircraft had grown so large that the Allison J71 turbojet intended for it was abandoned in favor of the more powerful Pratt & Whitney J75. Anticipating a protracted development of the engine, it was expected that the first aircraft would use the smaller Pratt & Whitney J57. Near the end of 1953, the entire program was canceled by the USAF due to a number of delays and uncertainties regarding the aircraft. However, on 28 June 1954, the USAF officially ordered 15 F-105s (two YF-105As, four YF-105Bs, six F-105Bs, and three RF-105Bs) under the Weapon System designation WS-306A. The YF-105A prototype first flew on 22 October 1955, with the second YF-105A following on 28 January 1956. In spite of being powered by a less potent J57-P-25 engine with 15,000 pounds-force (67 kN) of afterburning thrust, the first prototype attained the speed of Mach 1.2 on its maiden flight. (The J75 was expected to generate 24,500 lbf (109 kN) with afterburner.) Both aircraft featured conventional wing root air intakes and slab-sided fuselages typical of the early jets; Republic viewed the prototypes as not being representative of the true capability of the aircraft due to numerous changes prior to production. Insufficient power and aerodynamic problems with transonic drag, as well as Convair's experience with their F-102, led to a redesign of the fuselage to conform to the area rule, giving it a characteristic "wasp waist". In combination with the distinctive forward-swept variable-geometry air intakes which regulated airflow to the engine at supersonic speeds and the J75 engine, this redesign enabled the F-105B to attain Mach 2.15. In March 1956, the USAF placed a further order for 65 F-105Bs and 17 RF-105Bs. In order to conduct the nuclear mission, an MA-8 fire control system, AN/APG-31 ranging radar, and K-19 gunsight to allow for toss bombing were integrated. The first pre-production YF-105B flew on 26 May 1956. Five of the F-105C trainer variant were added to the procurement plan in June 1956, before being canceled in 1957. The RF-105 reconnaissance variant was canceled in July 1956. The first production F-105B was accepted by the Air Force on 27 May 1957. In June 1957, Republic Aviation requested that the F-105 be named Thunderchief, continuing the sequence of the company's Thunder-named aircraft: P-47 Thunderbolt, F-84 Thunderjet, and F-84F Thunderstreak. The USAF made the name official a month later. The final 143 Thunderchiefs built were of the two-seat F-105F trainer variant. Based on the F-105D, this model was 31 inches (79 cm) longer to provide room for the rear cockpit; otherwise, the aircraft had similar flight performance to the preceding F-105D. A total of 833 F-105s were completed before production ended in 1964. The F-105 had been designed for a short nuclear campaign, leading to shortcomings that became evident in a lengthy conventional war, such as a poor hydraulics layout and fuel tanks that were not self-sealing. Subsequent upgrades improved the reliability and weapons capacity of the existing F-105Ds. In response to the surface-to-air missile (SAM) threat experienced in the skies above Vietnam, dozens of F-105Fs were converted into anti-radar "Wild Weasel" aircraft, culminating with the F-105G. 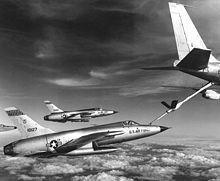 F-105D Thunderchiefs refueling from a Boeing KC-135 tanker. The initial reaction of the fighter pilot community to their new aircraft was lukewarm. Between its massive dimensions and troubled early service life, the F-105 had garnered a number of uncomplimentary nicknames. In addition to the aforementioned "Thud", nicknames included the "Squat Bomber", "Lead Sled", and the "Hyper Hog" and/or "Ultra Hog". The latter two names arose from the F-105's predecessors, the Republic F-84 Thunderjet and F-84F Thunderstreak, nicknamed "Hog" and "Super Hog", respectively. According to F-105 pilots and crews, the "Thud" nickname was inspired by the character "Chief Thunderthud" from the Howdy Doody television series. The rear cockpits of several two-seat F-105Fs were modified under project Commando Nail with an R-14A radar and a radar scope that offered high resolution. These aircraft were used for all-weather and night low-level strikes against especially dangerous targets by a unit from the 13th Tactical Fighter Squadron (1966–1975) dubbed "Ryan's Raiders" starting in April 1967. Some of these aircraft were later converted to the Wild Weasel III standard. In an effort to thwart MiG attacks, several F-105Fs were also fitted with Hallicrafters QRC-128 communication jamming system under project Combat Martin. The North Vietnamese interceptor force followed Soviet air-defense doctrine, with pilots under rigid direction of ground controllers over radio links. The QRC-128, nicknamed "Colonel Computer", filled up the rear cockpit of the F-105F. It bounced voice communications over the radio channel back out after a delay, resulting in an obnoxious garble. However, the first time the Combat Martin was used, the US National Security Agency (NSA), in charge of US strategic signals intelligence, ordered the Air Force to cease and desist immediately, since the NSA believed that the intelligence obtained by monitoring the channels outweighed the benefits of jamming them. Experience in Vietnam demonstrated the need for a better visual and blind bombing capability. In March 1968, the Air Force ordered development of an upgraded bombing/navigation system, incorporating a Singer-General Precision inertial navigation system, improvements to the AN/APN-131 navigation radar, and solid-state circuitry for the R-14A radar, which was redesignated R-14K. Furthermore, the digital AN/ARN-92 long-range navigation receiver replaced the problematic AN/ARN-85 receiver. The additional avionics were housed in a long, raised dorsal spine. The modified bombing/navigation system was known as Thunderstick II. F-105s with this system could achieve a bombing circular error of probability (CEP) of 50 feet (15 m) from an altitude of 15,000 ft (4,600 m). Although the first Thunderstick II aircraft flew in 1969, they were not used in Vietnam. A total of 30 F-105Ds received this modification. In 1965, the USAF began operating two-seat North American F-100F Super Sabres specially equipped for Suppression of Enemy Air Defenses mission in Vietnam. Nicknamed the Wild Weasel, these aircraft achieved a number of victories against North Vietnamese surface-to-air missile radars. The second crew member was a Navigator trained as an Electronic Warfare Officer (EWO) to decipher sensor information and guide the pilot towards the targets. However, the F-100F was an interim solution, since its limited payload often required multiple aircraft to conduct a successful strike; it also lacked the speed and endurance to effectively protect the F-105. F-105F with armament layout in August 1964; including 20 mm (0.79 in) cannon rounds, 2.75 in (70 mm) rockets, Bullpup and Sidewinder missiles, general purpose bomb, cluster bombs, LAU-3A Launchers, flare and chaff dispensers and drop tanks. The resulting EF-105F Wild Weasel III[N 1] (the EF designation was popularly used but unofficial) supplemented its sensors and electronic jamming equipment with AGM-45 Shrike anti-radiation missiles and conventional bombs, giving it an offensive capability lacking in the F-100F. The first of these aircraft flew on 15 January 1966 and they began arriving in Southeast Asia in May, flying their first mission on 6 June 1966, with five assigned to the 13th TFS at Korat RTAFB and six more to the 354th TFS at Takhli RTAFB. In a typical early mission, a single EF-105F would accompany one or two flights of F-105Ds to provide protection from enemy ground fire. While this strategy was effective in reducing F-105D losses, the Weasel aircraft suffered heavy casualties with five of the first 11 lost in July and August 1966. Attacks into high-risk environments saw the Weasels operating in "Iron Hand" Hunter-Killer flights of mixed single-seat and two-seat Thunderchiefs, suppressing sites during attacks by the strike force and attacking others en route. In the fall of 1967, EF-105Fs began to be upgraded to the definitive Wild Weasel Thunderchief, the F-105G. The F-105G incorporated a considerable amount of new SEAD-specific avionics, including an upgraded Radar Homing and Warning (RHAW) system which required a redesign of the wingtips. To free outboard hardpoints for additional weapons, the Westinghouse AN/ALQ-105 electronic countermeasures were permanently installed in two long blisters on the underside of the fuselage. Thirty aircraft were fitted with pylons to carry the AGM-78 Standard anti-radiation missile. On a typical mission, the F-105G carried two Shrikes on outboard pylons, a single Standard on an inboard pylon balanced by a 450 US gal (1,700 L) fuel tank on the other side, and a 650 US gal (2,500 L) centerline fuel tank. Notes: The costs above are in approximately 1960 United States dollars and have not been adjusted for inflation. 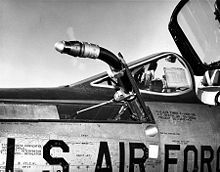 F-105D refueling probe detail. The -D model had two types of in-flight refueling equipment: a probe (for the drogue) and a receptacle (for the boom). By 1964, the F-105B was relegated to USAF Air National Guard (ANG) squadrons. It was replaced in frontline service by the definitive F-105D whose advanced NASARR R-14A radar and AN/ASG-19 Thunderstick fire-control system gave it all-weather capability. The R-14A radar also added a terrain-avoidance radar capability, while a completely new instrument panel was fitted, replacing dial-type instrument with vertical tape instruments which were easier to read in combat. In order to accommodate the new radar, with a much larger radar dish, the forward fuselage was redesigned, increasing overall length by 16 inches (41 cm). The F-105D entered service with the 335th TFS in September 1960, although it was not fully operational on the F-105D until early 1961. 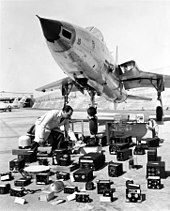 The first overseas F-105 units formed in West Germany in 1961, with the 36th Tactical Fighter Wing at Bitburg Air Base in May and the 49th Tactical Fighter Wing at Spangdahlem Air Base in October. Both wings had a primary tactical nuclear strike role for NATO. The F-105D was also deployed to the Pacific, with the 18th Tactical Fighter Wing at Kadena in Okinawa converting in 1962 and the 8th Tactical Fighter Wing converting from 1963. In spite of a troubled early service life, the F-105 became the dominant attack aircraft early in the Vietnam War. The F-105 could carry more than twice the bomb load farther and faster than the F-100, which was used mostly in South Vietnam. In a foreshadowing of its Wild Weasel role, the first F-105D combat mission of the war involved an attack on 14 August 1964 against an anti-aircraft artillery site on Plaine des Jarres. This mission was carried out by aircraft of the 36th TFS, 6441st Tactical Fighter Wing deployed from Yokota Air Base, Japan to Korat Royal Thai Air Force Base, Thailand. The first Thunderchief lost in the war also occurred during this mission, although the pilot managed to return the aircraft to Korat. The first strike mission took place on 13 January 1965 with the destruction of the Ben Ken bridge in Laos. In early 1965 additional F-105 squadrons were deployed to Korat and Takhli air bases in Thailand. At the start of Operation Rolling Thunder in March 1965, large numbers of F-105Ds were shipped to these bases to participate in intense bombing missions. A U.S. Air Force F-105D Thunderchief shot down over North Vietnam. On 3 April 1965, a total of 79 aircraft, including 45 F-105 Thunderchiefs, were sent against the Thanh Hoa Bridge, nicknamed "Dragon's Jaw". 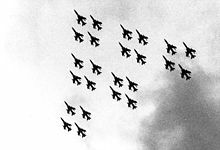 The next day, enemy MiGs were encountered during a second run upon the bridge; a total of eight MiG-17s faced 46 F-105s escorted by a MiGCAP flight of 21 F-100 Super Sabres. The MiG-17s evaded the escorts using altitude and cloud cover, instead focusing upon the bomb-laden Thunderchiefs. Two Thunderchiefs were lost to the MiG-17s; a third, thought to be lost to groundfire, was later claimed by the North as downed by a MiG-17. An F-100 claimed the only probable MiG-17 kill, although a Vietnamese pilot believed three of his comrades were shot down by F-105s. One F-105 piloted narrowly escaped. USAF Chief of Staff General John P. McConnell was "hopping mad" to hear that two F-105s had been shot down by Korean War-era subsonic North Vietnamese MiGs. The Thanh Hoa Bridge proved resistant to aerial bombing, multiple missions were flown to damage the bridge both by F-105s and U.S. Navy aircraft. In December 1966, the Vietnam People's Air Force (VPAF)'s MiG-21 pilots of the 921st Regiment downed 14 F-105s without any losses. On a typical combat mission into North Vietnam, the F-105D carried two 450 US gal (1,700 L) wing-mounted fuel tanks, a 390 US gal (1,500 L) fuel tank in the bomb bay, and five 1,000 lb (450 kg) or six 750 lb (340 kg) bombs, and required inflight refueling going to and sometimes returning from Hanoi 700 mi (1,100 km) distant. 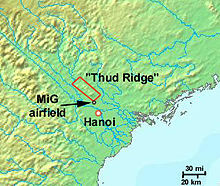 F-105s flying in the vicinity of Hanoi would routinely travel around mountainous terrain nicknamed Thud Ridge to evade the air defenses surrounding the city. Colonel Jack Broughton, an F-105 pilot in Vietnam, noted the demands of flying close to Hanoi gave "simply no room for error". On 11 August 1967, F-105Ds from 335th Tactical Fighter Squadron with support from F-105 Wild Weasels from 338th Tactical Fighter Squadron made the first of many successful attacks on the Paul Doumer bridge over the Red River. Flying low-altitude missions and conducting dive bombings forced the F-105s into range of North Vietnamese anti-aircraft guns, sometimes coming under heavy fire. USAF F-105s were escorted by F-4s to protect them against enemy fighters. However, the Thunderchief was officially credited with 27.5 air-to-air victories against VPAF aircraft at the cost of 17 aircraft lost to enemy fighters (North Vietnamese pilots claimed to have shot down an additional 23 F-105s but none have been confirmed by USAF). All victories were against MiG-17s. Of these 24.5 were shot down with cannon fire (one victory was shared with an F-4), and three with AIM-9 Sidewinder missiles. One F-105F is unofficially credited with downing three MiGs—one by air-to-air missile, the second by cannon fire and the third by jettisoning the centerline rack full of bombs directly into the path of a surprised MiG. On 31 May 1968, a dedication ceremony took place at the United States Air Force Academy to honor graduates who had served in Vietnam. An F-105, which had been assembled using parts from ten different F-105s that had seen service in Vietnam, was placed on permanent static display. The ceremony included the entire cadet wing, the superintendent and commandant of cadets of the USAFA, a representative of Republic Aircraft, members of the press, among others. To conclude the ceremony, a flight of four F-105s from McConnell AFB were to fly over in formation at 1,000 feet above the ground and then fly over singly at 250 feet. The formation portion happened as planned. But the flight leader, Lt Col James "Black Matt" Matthews, came back for the single-file pass and exceeded the speed of sound at less than 100 feet. The ensuing sonic boom broke hundreds of windows and fifteen people sustained cuts. USAF Captain Merlyn H. Dethlefsen was awarded the Medal of Honor and Capt Kevin "Mike" Gilroy the Air Force Cross for an F-105F Wild Weasel mission on 10 March 1967, flying F-105F, serial number 63-8352. After their aircraft was damaged by ground fire, Dethlefsen and Gilroy elected to stay in the skies above the steel works at Thai Nguyen until the SAM site was found and destroyed. As production of F-105s had ended, the type was replaced in the Vietnam War by other aircraft, primarily the F-4 Phantom II. In October 1970, the 355th Tactical Fighter Wing, which was based at Takhli RTAFB, Thailand, and was the last F-105D unit in Southeast Asia, began to return to the U.S. The F-105G Wild Weasel versions soldiered on until the end of the war. They were gradually replaced by F-4G Wild Weasel IVs. 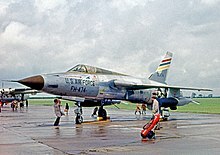 The Thunderchief was rapidly withdrawn from USAF service after the end of the Vietnam War. Of the 833 F-105s built, a combined 395 F-105s were lost in Southeast Asia, including 334 (296 F-105Ds and 38 two-seaters) lost to enemy action and 61 lost in operational accidents. Following the war the USAF began transferring the remaining aircraft to Air Force Reserve (AFRES) and Air National Guard (ANG) units. By the late 1970s, these aging Thunderchiefs were becoming difficult to maintain. The last F-105Gs with the 128th Tactical Fighter Squadron of the Georgia ANG were retired on 25 May 1983. The last flight of the F-105 Thunderchief was by the AFRES 466th Tactical Fighter Squadron with F-105Ds on 25 February 1984. Two pre-production prototypes with P&W J57 engine model. Four pre-production aircraft with P&W J75 engine. Initial production model with AN/APN-105 navigational radar, 71 built. Test aircraft built from re-allocated RF-105B airframes; three built. Proposed reconnaissance version of the F-105B; none built. Three were ordered but completed as JF-105Bs. Proposed dual-control trainer; canceled in 1957, none built. The definitive production model, all-weather capability because of advanced avionics, including AN/APN-131 navigational radar; 610 built. Proposed reconnaissance version of the F-105D; none built. Proposed trainer version of F-105D; cancelled in 1959, none completed. Two-seat trainer version of F-105D with lengthened forward fuselage. It was fully combat-capable and had dual controls, taller fin, and increased takeoff weight; its first flight took place on 11 June 1963. A total of 143 were built. It featured the AN/APN-148 navigational radar. Initial designation for a Wild Weasel/SEAD version, 54 converted from F-105Fs. Two-seat Wild Weasel/SEAD improved version of EF-105F conversions. The variant used the AN/APN-196 navigational radar. A F-105D Thunderchief at the National Museum of the United States Air Force, the "Memphis Belle II"
Wikisource has several original texts related to: Audio recordings and transcripts with comments of actual F-105 Wild Weasel combat missions over Vietnam. ^ The Wild Weasel IA and II designations referred to experimental conversions of F-105Ds and F-105Fs respectively which were used to evaluate various sensor and Electronic countermeasure (ECM) equipment. The Wild Weasel III used similar avionics to the Wild Weasel I F-100s. ^ Knaack 1978, p. 200. ^ Davies 2010, p. 6. ^ Crosby 2002, p. 229. ^ a b "Republic F-105D Thunderchief". National Museum of the US Air Force, 20 December 2016. ^ a b Knaack 1978, p. 191. ^ Davies 2010, pp. 6–7. ^ a b Green and Swanborough 2001, pp. 500–501. ^ Anderton 1983, p. 18. ^ a b c Peacock 1986, p. 186. ^ Anderton 1983, pp. 18-19. ^ Angelucci and Bowers 1987, pp. 408, 410. ^ Anderton 1983, p. 22. ^ Anderton 1983, pp. 28-32. ^ Davis 2002, pp. 124–125. ^ Angelucci and Bowers 1987, p. 408. ^ a b Knaack 1978, p. 192. ^ Anderton 1983, p. 25. ^ a b Richardson 1992, pp. 12–13. ^ a b Knaack 1978, p. 193. ^ Richardson 1992, pp. 12–13, 15. ^ a b c Davis 2002, p. 130. ^ Anderton 1983, pp. 62-63. ^ a b Richardson 1992, p. 20. ^ Anderton 1983, p. 75. ^ Angelucci 1987, p. 410. ^ Werrell, Kenneth p. "Did USAF Technology Fail in Vietnam?" Airpower Journal, Spring 1998. ^ a b Richardson 1992, pp. 28, 32–33, 38. ^ Anderton 1983, pp. 125-126. ^ Taylor 1966, pp. 243–244. ^ Republic F-105 Thunderchief Pilot's Flight Operating Instructions 2008, p. 16. ^ Davis and Menard 1998, p. 47. ^ Davis 2002, p. 141. ^ Richardson 1992, pp. 22–24. ^ Toperczer 2001, pp. 65–74. ^ a b Futrell et al. 1976, p. 157. ^ Knaack 1978, p. 199. ^ a b Higham and Williams 1975, pp. 185-190. ^ Anderton 1983, p. 11. ^ Laurence (pseudonym), Mike (7 January 1994). "The Thud". Retrieved 18 April 2015. ^ Broughton 2006, pp. 38-39. ^ Peacock 1986, p. 206. ^ Davis 2000, pp. 26–27. ^ Knaack 1978, p. 202. ^ Davis 2000, pp. 27–28. ^ Davis and Menard 1998, p. 49. ^ Davis 2002, p. 137. ^ Dorr and Bishop 1996, pp. 60–61. ^ a b c Lake 2004, p. 31. ^ a b c Davis 2002, p. 135. ^ a b Davis 2000, p. 26. ^ Davis and Menard 1998, p. 53. ^ Richardson 1992, pp. 38–39. ^ Knaack 1978, pp. 201-203. ^ Knaack 1978, pp. 195, 200, 203. ^ a b Knaack 1978, p. 195. ^ Anderton 1983, p. 61. ^ Knaack 1978, p. 194. ^ Peacock 1986, pp. 186–187. ^ Davis 2002, pp. 128–129. ^ Davis and Menard 1998, p. 43. ^ Davis and Menard 1998, p. 16. ^ a b Davis 2002, pp. 129–130. ^ Davis and Menard 1998, pp. 17–18. ^ a b Peacock 1986, p. 188. ^ Knaack 1978, p. 197. ^ Davis and Menard 1998, p. 5. ^ Knaack 1978, pp. 197-198. ^ Anderton 1983, p. 80. ^ Knaack 1978, pp. 198-199. ^ "Republic F-105D." National Air and Space Museum. Retrieved: 30 June 2011. ^ a b Peacock 1986, p. 189. ^ a b Davis 2000, pp. 17–18. ^ "U.S. Air Force Fact Sheet 374th Airlift Wing: History." Archived 28 September 2011 at the Wayback Machine yokota.af.mil. Fact Sheet. Retrieved: 30 June 2011. ^ Peacock 1986, pp. 189–190. ^ Davies 2010, pp. 21–23. ^ Sherwood 2004, p. 267. ^ Hillaker, Harry. "Tribute To John R. Boyd." wingsoverkansas.com. Retrieved: 30 June 2011. ^ Sherwood 2004, p. 268. ^ "Armed Forces: How It Happened." Time, 16 April 1965. ^ Sherwood 2004, pp. 268-269. ^ "Vietnamese Aces - MiG-17 and MiG-21 pilots". Acepilots.com. Retrieved 9 August 2013. ^ Richardson 1992, pp. 28–30. ^ Broughton 2006, pp. 26-27. ^ Broughton 2006, p. 31. ^ Davies 2010, pp. 50–51. ^ Sherwood 2004, p. 265. ^ Davis and Menard 1998, p. 73. ^ Davis and Menard 1998, p. 85. 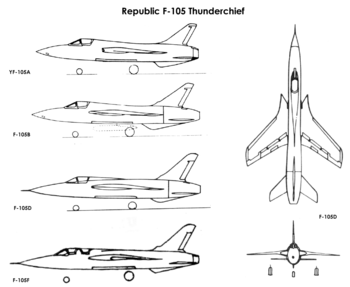 ^ "Thunderchief Worldwide Report on Republic's F-105 Fighter-Bomber" (pdf-678 Kb). 12o'clock low. June 1968. Retrieved 17 June 2014 – via jabara.usafalibrary.com. ^ Herts, Ray (1 June 1968). "Sonic Boom in Fly-Over Damages Academy Buildings". Colorado Springs Gazette-Telegraph. pp. 1, 16. Archived from the original (scan) on 14 July 2014. Retrieved 17 June 2014 – via usafa68.org. ^ Correll, J.T. "Calculated Courage at Thai Nguyen." airforce-magazine.com. Retrieved: 23 March 2006. ^ Frisbee, J.L., ed. " Valor: Wild, Wild Weasel". Air Force magazine, April 1985. Retrieved: 19 October 2011. ^ Richardson 1992, pp. 40–41. ^ Richardson 1992, pp. 41–45. ^ Davies 2002, p. 149. ^ Richardson 1992, pp. 44–45. ^ Davis and Menard 1998, p. 63. ^ Davis and Menard 1998, p. 99. ^ a b c d e f g Donald 1997, p. 773. ^ Peacock 1986, p. 187. ^ Davis 2002, p. 129. ^ "Standard Aircraft Characteristics: F-105D-31" (PDF). US Air Force. June 1970. Retrieved 14 December 2018. Anderton, David. Republic F-105 Thunderchief. Oxford, UK: Osprey Publishing, 1983. ISBN 0-85045-530-8. Angelucci, Enzo and Peter M. Bowers. The American Fighter. Sparkford, UK: Haynes Publishing, 1987. ISBN 0-85429-635-2. Archer, Robert D. The Republic F-105 "Thunderchief": The Story of Republic's Mach 2 Strike Fighter in Peace and at War. Fallbrook, California: Aero Publishers Inc., 1969. Broughton, Jack. Thud Ridge. St. Paul, Minnesota: MBI Publishing Company, 2006. ISBN 978-0-85979-116-8. Davies, Peter E. F-105 Thunderchief Units of the Vietnam War (Osprey Combat Aircraft #84). Oxford, UK: Osprey Publishing Limited, 2010. ISBN 978-1-84603-492-3. Davis, Larry. "F-105 in Southeast Asia". Wings of Fame, Volume 18, 2000. London: Aerospace Publishing. pp. 16–37. ISBN 1-86184-061-6. ISSN 1361-2034. Davis, Larry. "Warplane Classic: Republic F-105 Thunderchief". International Air Power Review, Volume 6, Autumn/Fall 2002, pp. 120–155. Norwalk, Connecticut, USA: AIRtime Publishing. ISBN 1-880588-46-3. ISSN 1473-9917. Davis, Larry and David Menard. Republic F-105 Thunderchief (Warbird Tech Series, Vol. 18). North Branch, Minnesota: Specialty Press, 1998. ISBN 1-58007-011-6. Futrell, R. Frank et al. Aces and Aerial Victories: The United States Air Force in Southeast Asia, 1965-1973. Washington, D.C.: Office of Air Force History and the Albert F. Simpson Historical Research Center, 1976. ISBN 0-89875-884-X. Higham, Robin and Carol Williams. Flying Combat Aircraft of USAAF-USAF (Vol.1). Rockville, Maryland: Air Force Historical Foundation, 1975. ISBN 0-8138-0325-X. Jenkins, Dennis R. F-105 Thunderchief: Workhorse of the Vietnam War. New York: McGraw-Hill, 2000. ISBN 0-07-135511-1. Kinzey, Bert. F-105 Thunderchief. Fallbrook, California: Aero Publishers Inc., 1982. ISBN 0-8168-5020-8. Knaack, Marcelle Size. Encyclopedia of US Air Force Aircraft and Missile Systems: Volume 1, Post-World War II Fighters, 1945–1973. Washington, D.C.: Office of Air Force History, 1978. ISBN 0-912799-59-5. Lake, Jon. "Classics Compared: F-105G & F-16CJ". Air International, Vol. 66, No 2, February 2004, pp. 30–39. ISSN 0306-5634. Neubeck, Ken. F-105 Thunderchief In Action. Carrollton, Texas: Squadron/Signal Publications, 2002. ISBN 0-89747-447-3. Neubeck, Ken. F-105 Thunderchief Walk Around. Carrollton, Texas: Squadron/Signal Publications, 2000. ISBN 0-89747-418-X. Peacock, Lindsay. "The Thud ... Republic's Last Fighter". Air International, Vol. 30, No. 4, April 1986, pp. 185–194, 206–207. ISSN 0306-5634. Price, Alfred. The History of US Electronic Warfare, Volume III: Rolling Thunder Through Allied Force–1964 to 2000. New York: The Association of Old Crows, 1989. ISBN 0-9703794-0-4. Republic F-105 Thunderchief Pilot's Flight Operating Instructions. Los Angeles: Persiscope Films LLC, originally published by the United States Air Force, 2008 (reprint). ISBN 1-935327-36-4. Richardson, Doug. Republic F-105 Thunderchief (Classic Warplanes). New York: Smithmark Publishers Inc., 1992. ISBN 0-8317-1410-7. Sherwood, John Darrell. Afterburner: Naval Aviators and the Vietnam War. New York: NYU Press, 2004. ISBN 0-8147-9842-X. Stoff, Joshua. The Thunder Factory: An Illustrated History of the Republic Aviation Corporation. London: Arms & Armour Press, 1990. ISBN 1-85409-040-2. Toperczer, Istvan. MiG-17 and MiG-19 Units of the Vietnam War. Oxford, UK: Osprey Publishing, 2001. ISBN 1-84176-162-1. Wikimedia Commons has media related to F-105 Thunderchief. Hi-res cutaway of the Republic F-105D Thunderchief by Flight Global.